Children in care are one of our most vulnerable and disadvantaged groups and are therefore more likely to undertake the greatest risk-taking behaviours, be more at risk of poor health and educational outcomes, and are more at risk of being exploited[HM Government. Tackling Child Sexual Exploitation. London: Cabinet Office, March 2015]. 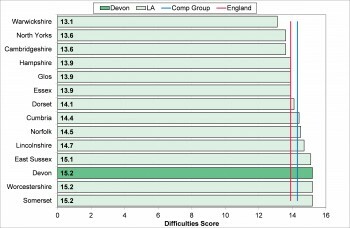 The gap between the life chances of children in care and other children and young people can be seen in Strengths and Difficulties questionnaire (SDQ) scores (Figure 5.15). As with many other groups of people where health outcomes are worse, finding good-quality information to assess the impact of strategies or services is challenging. To do this, we also need to understand children in care’s own perspective of health and wellbeing, and of health and social care. 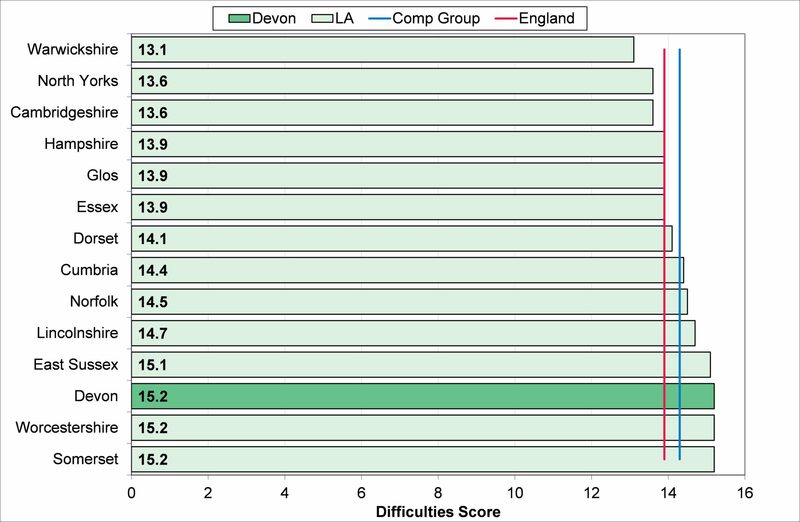 Figure 5.15: Average of total difficulties score for all looked after children aged between four and 16 (inclusive) at the date of their latest assessment, who have been in care for at least 12 months on 31 March, Devon Local Authority Comparator Group, 2014.